Before you start thinking that I’m here to replace all of your actual meat burgers with quinoa, know that I am not. I grew up eating various iterations of vegeburgers, some excellent and most not so excellent. As for the idea that a Boca burger is a reasonable substitute for actual meat, I firmly disagree. Unless you’re a vegetarian, if you want a burger, you want a real burger and no matter how delicious, a vegeburger isn’t going to cut it. To that end, I’m selling you on this the same way I sold my husband on vegeburgers: an alternative sandwich option. Sort of like a snowcone and a chocolate brownie are both delicious desserts, but if you want chocolate a snowcone won’t do. We had ours on a bun with the slaw and peanut sauce, but if you’re vegan (or just not a fan of carbs, whatever), they really aren’t necessary. And know that they don’t resemble the sad little pre-formed quinoa/boca/TVP you’re picturing in your head. There are 3 components: the patty, the slaw, and the sauce. 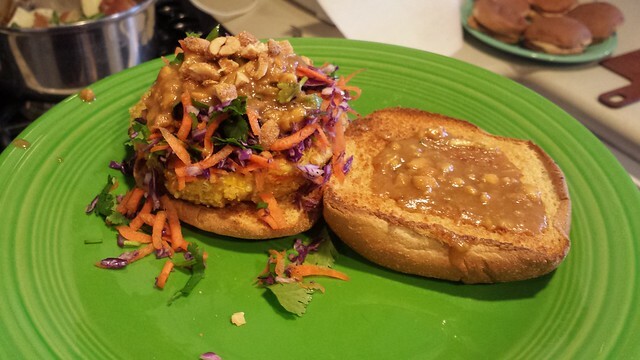 You can easily make the slaw while the quinoa is cooking and then mix up the sauce while the patties are cooking. 1. Toast the uncooked quinoa in a tablespoon of olive oil over medium high heat for about 3 minutes. Add in the cup of water, bring to a boil, cover and simmer for 15 minutes. Meanwhile, pulse the chickpeas, cornmeal, oatmeal, salt, paprika, garlic and sesame oil together in a food processor until well combined (it should look a bit like wet sand). 2. Transfer to a bowl and add stir in the egg. Finely dice the bell pepper and onion (I put them in the food processor) and stir them into the mixture. Then fold in the cooked quinoa to create a thick, cement-like mixture. If it needs a bit more moisture to hold it together, add in a tiny bit of olive oil. 3. Shred the cabbage and carrots, and chop the cilantro. Toss together to make the slaw. 4. Form the quinoa mixture into 8 patties and fry in a tiny bit of oil over medium high heat. Alternatively, you could use an electric skillet with no oil at 350. Fry them for a few minutes on each side until they start to turn golden brown and crispy. 5. Whisk all of the sauce ingredients together to make the sauce. To serve, top each patty with a heap of slaw and drizzle the sauce over the top. Serve with or without a bun.